The sympathetic nervous system affects many bodily functions. It would clearly be a very inefficient means of control if the whole system had to be activated at once, and this is not so: particular branches of the sympathetic nervous system are activated specifically under different conditions. This could make a complete description of sympathetic activation very complex, but for the most part it is still reasonable to think of the general effects of the whole system. Not only does the whole of the sympathetic nervous system tend to respond as one, but also the secretion of adrenaline from the adrenal medulla (which is effectively another extension of the sympathetic nervous system) tends to occur under the same conditions. This makes some generalisations possible. The activity of the sympathetic nervous system is constantly changing, and is, in fact, changing in specific branches, regulating physiological functions such as heart rate and blood pressure; but overall (as reflected by the concentration of noradrenaline in the plasma) it is relatively constant during normal daily life. The secretion of adrenaline, similarly, is relatively constant during everyday life. When a 'stress' hits the system, on the other hand, the adrenal medulla springs into action, and there is a more general activation of the sympathetic nervous system. The stimuli for activation of the sympathetic nervous system are generally those of 'stress' in the most general sense. This was first clearly described by the American physiologist Walter B. Cannon, whose book Bodily changes in pain, hunger, fear and rage, published in 1915, summarised the role of adrenaline and of the sympathetic nervous system in stress states. For instance, the effects of the sympathetic nervous system on the circulatory system (heart and blood vessels) are brought into play by a fall in blood pressure. This may happen quite often. Think for a moment of the hydrostatic pressure of a column of blood about 2 metres high. Then contemplate the fact that when you get out of bed and stand up, the pressure of blood available to perfuse your brain is going to drop rapidly and dramatically. This is an immediate stimulus to the sympathetic nervous system to maintain blood pressure, which it does, as we shall see in more detail below, by effects both on the heart and the blood vessels. Most people are familiar with a feeling of faintness on standing up too quickly, particularly on a hot day when blood volume may be depleted by sweating. The brain receives the information that blood pressure is beginning to fall from receptors in the great vessels, collates this in the hypothalamus and causes the appropriate responses to be set in motion. Another type of stress is that of exercise. Even gentle exercise (running for the bus, for instance) requires both circulatory and metabolic adjustments. More substrate needs to be made available for energy production, and blood flow and oxygen delivery need to be increased. The only component over which we have voluntary control is the decision to cause our muscles to contract in a particular way. The necessary adjustments that follow are looked after by the sympathetic nervous system, triggered by changes in the circulation. For example, diversion of the blood to the muscles, brought about by local metabolic changes, will tend to cause a fall in blood pressure: the sympathetic nervous system will counteract this. Similarly, increasing acidity of the blood, caused by lactic acid production, will trigger an increased depth of breathing via chem-oreceptors and activation of the sympathetic nervous system. A more severe stress, rarely met in everyday life but commonly studied in laboratories (because it is a reproducible test of responses to stress, unlike, for instance, trying to frighten someone! 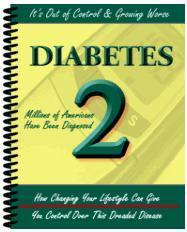 ), is a rapid lowering of the concentration of glucose in the blood to produce the state of hypoglycaemia. 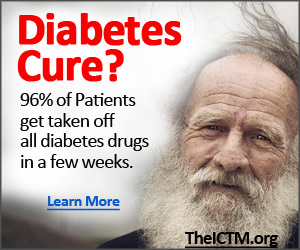 Experimentally this is brought about by an injection of insulin. Outside the laboratory it can occur in certain metabolic diseases in which gluconeogenesis or glycogenolysis are impaired, or in people with diabetes who have injected too much insulin. Glucose receptors in the hypothalamus relay the information, and there is activation both of the sympathetic nervous system generally and of adrenaline secretion from the adrenal medulla (Fig. 7.6). We will see shortly how these responses act to restore a normal glucose concentration. Note that I have emphasised a rapid lowering of glucose concentration. The slow, gentle fall that occurs during early starvation (e.g. fasting overnight) is probably not a stimulus for the sympathetic nervous system. The direct role of the sympathetic nervous system and of adrenaline in metabolic regulation is most important in acute stress situations rather than normal everyday fluctuations. On the other hand, it was stated above that the sympathetic nervous system is active continuously, maintaining bodily functions such as blood pressure; these specific actions of the sympathetic nervous system do, of course, also affect metabolism indirectly; if blood flow to the brain is reduced, it cannot metabolise at a normal rate. More dramatic stress states such as physical injury or severe infection are very potent stimuli for activation of the sympathetic nervous system and of adrenaline secretion from the adrenal medulla. The stimuli reaching the brain are multiple. The special senses may alert the brain to danger (you may see a bus about to hit you, for example). Loss of blood reduces the circulating blood volume; this is sensed through pressure receptors and is a particularly potent stimulus for adrenaline secretion. Lack of blood volume leads to impaired oxygen delivery and hence anaerobic glycolysis; the resulting acidity in the blood is detected by chemoreceptors and relayed to the brain. There are also afferent (incoming) impulses arriving in the nerves responding to pain, tissue damage, etc. All these afferent signals are integrated in the hypothalamus, and appropriate activation of the sympathetic nervous system and adrenal medulla is set in train from there. It is probably in such extreme situations that the sympathetic nervous system and adrenal medulla play their most vital roles. Fig. 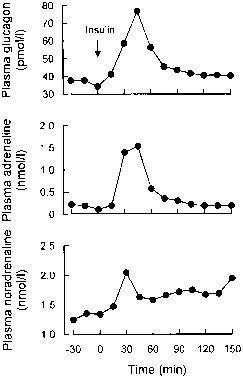 7.6 Plasma glucagon, adrenaline and noradrenaline concentrations in response to rapid lowering of the blood glucose concentration (by injection of insulin). Based on Gerich, J., Davis, J., Lorenzi, M. et al. (1979) Hormonal mechanisms of recovery from insulin-induced hypoglycemia in man. Am J Physiol 236: E380-E385. With permission of the American Physiological Society. It should now be appreciated that the sympathetic nervous system can influence metabolism in both direct and indirect ways. The indirect ways include changes in the circulatory system. They also include effects on hormone secretion, which we will consider below. What is a good sitmuli for your sympathetic nervous system? What type of stimuli/situations activate the sympathetic nervous system? What stimulus could lead to activation of sympathetic system?